10 pp. Roman, 311 pp. 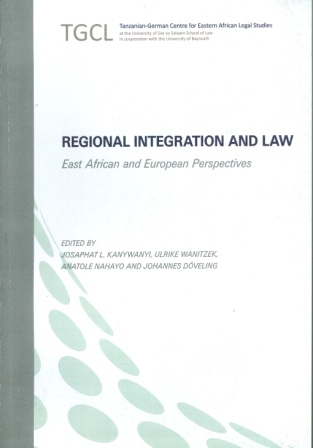 This paper collection on Regional Integration and Law – East African and European Perspectives is the fourth volume of the TGCL Series, a series of edited volumes produced at the Tanzanian-German Centre for Eastern African Legal Studies (TGCL). After an Introduction on the major challenges of regional legal integration, Part I, devoted to East African perspectives, begins with a discussion of the role of leadership in the implementation of the African Peace and Security Architecture Framework in the East African Community. Following this, harmonisation of domestic tax laws is analysed with regard to its potential as an instrument for regional integration, with the major example of Burundi’s new income tax law of 2013. Criminal procedural law in Tanzania is looked at in the light of human rights, especially the right to equality. The effectiveness of mandatory SIM card registration in Uganda is critically analysed. The protection of consumers against counterfeit and substandard pharmaceuticals in Tanzania is discussed within the framework of the Single Customs Territory of the East African Community. In Part II, focused on European perspectives, a discussion of the relationship between the French Constitution and European Union law, exploring the “alchemy of sovereignty and integration”, is followed by articles on the specifically German challenges with regard to the incorporation of European Union law into the national body of laws, with case studies of the Euro Rescue Fund, consumer protection law, administrative law and labour law. In addition to these examples of regional legal integration within the European Union, the last article discusses the role played by another regional community of states, i.e. the Council of Europe and its European Convention on Human Rights, in the development of national family laws in Europe. The French Constitution and the European Union – The Alchemy of Sovereignty and Integration at the Service of the Constitutional Council?